"They found the still-childlike Beyonder playing out future events in space, trying to comprehend them, and he allowed them to believe he was just a mutated Inhuman (possibly a scenario drawn from Illuminati member Black Bolt's Mind.) Playing along with their demands he not go to Earth, the beyonder continued his voyage after they departed." 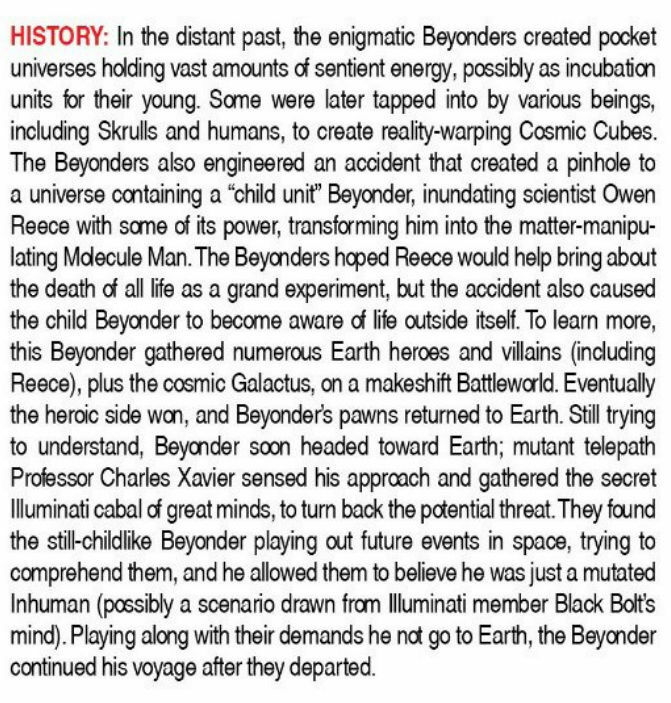 Beyonder was never a Inhuman Mutant and he has been a Child of the Beyonders from his original retcon into a Cosmic Cube. Jonathan Hickman wrote: Early on I talked with Brevoort about this and my understanding is that the editorial position regarding the “New Avengers: Illuminati” [miniseries] Bendis wrote was that it was all a construct of that Beyonder. It was all unreliable narrator stuff and he wasn’t Inhuman. I think that’s clearly the way we’ve gone, but I don’t know that Marvel would think they’ve ever moved off this path. It was just Beyonder shenanigans. Beyonder is still a Cosmic Cube! he has and always have been a child beyonder since his retcon!